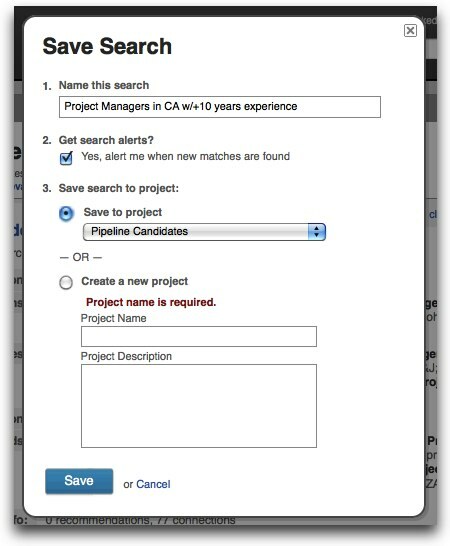 LinkedIn Recruiter Search Alerts notify you when new profiles show up on the network that match your search parameters. A wise man once said "Seek and ye shall find." But after awhile all that seeking can become a bit tedious. Wouldn't it be great if you could get someone else to do the seeking for you? If that sounds good to you, then you need to start using LinkedIn Recruiter Search Alerts. Search Alerts notify you when new profiles show up on the network that match your search parameters. Recruiter users each have up to 50 alerts which will run every night and return new results directly on their Dashboards. 1. From the top of your Dashboard, enter your search terms in the three quick search fields (Keywords, Title & Company) then click Search. 2. Review your results and fine tune your search criteria (adding Boolean expressions, new terms or editing others) to get better matches. 3. Next, use the refinement filters to pinpoint profiles by location, years of experience, or any number of other qualifications. 4. When your search yields the desirable results, click the Save this search link. 5. Give your search a name, check the alert box, select a Project to save it into, and click Save. Each night, LinkedIn Recruiter will run your search for you, so the next morning when you log in, you'll see the number of new profiles that match your search criteria. These are profiles of professionals who may have updated their profiles with completed job descriptions, summary or new location. Or they could be one of the approximately 2 million professionals who join LinkedIn each month. Either way, it's a perfect time to reach out to them because they just did something on LinkedIn that made their profiles match your search when they didn't the day before.